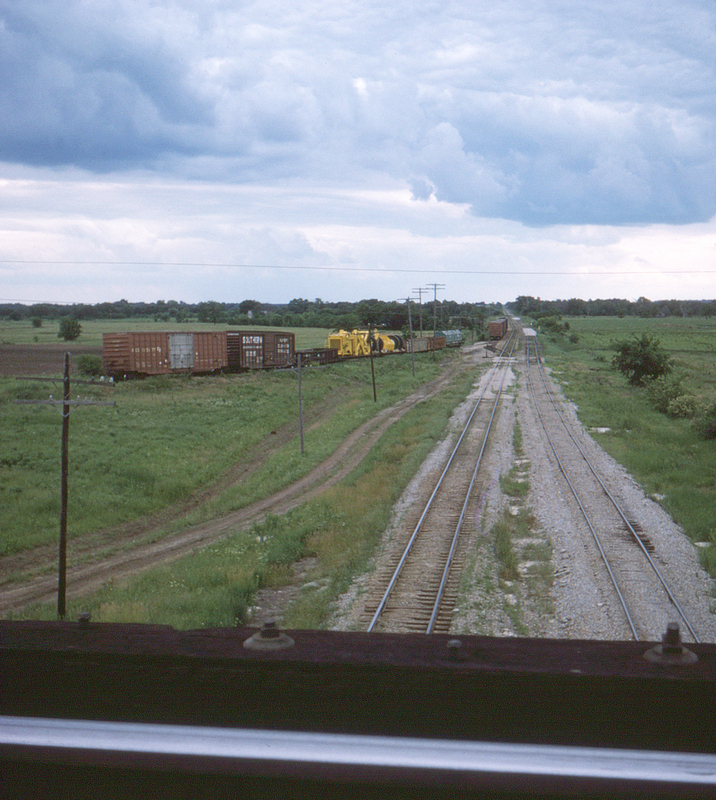 A few miles west of Nevada, Missouri, at a location called Eve on both railroads, the Missouri-Kansas-Texas crossed over the Kansas City Southern mainline. Here, seen from the Katy's wooden trestle, is the KCS mainline with the Katy interchange track at left. Unbeknownst to the photographer, the KCS at this time was just recovering from a near meltdown which began in 1972, the result of long-term deferred maintenance resulting in a nightmare blizzard of derailments which peaked in 1974 (with over 41 derailments in one month). Over the next three years the road spent $75 million on right of way maintenance with a major deadline looming: in 1976 unit trains of Powder River coal were to begin operating from Kansas City to three generating stations on the line. Here the effects of the reballasting program are starting to become evident. By 1978 the KCS was out of the woods. This page posted 8/1/2018; revised 1/1/2019. Text and photo ©2018 Lamont Downs.